The steep fall in oil price since August 2014 is mainly caused by oversupply. The oil sector and petroleum exporting nations are negatively affected by the low oil price; other sectors and countries are expected to benefit. We expect a recovery of the oil price starting in 2015 Q4 and accelerating during 2016. For the years thereafter we expect a slower gradual rise in the oil price. Nevertheless we have to emphasise that the level of uncertainty is very high. Since August 2014 we have observed a sharp fall in the oil price: from USD 105 to USD 50 per barrel for Brent oil in a period of only six months. Since March, the price of Brent has been hovering between USD 50 and USD 60. As discussed in our latest oil price update in December 2014, the most important causes of the price decline are the rise in US shale production and the unexpectedly strong supply from OPEC. The questions are which sectors and countries are most affected by the lower oil price and how do we expect the oil price to develop over the coming years? Compared to our research note of December 2014 we are more bearish on the oil price for 2015. The reduction of supply from the US shale producers did not materialise as quickly as previously expected, resulting in prolonged oversupply due to American shale oil. The effect of cheaper oil is, on balance, good for the world economy. A lower cost for oil implies more purchasing power for other goods and services. The assessment of the impact of the fall in oil price depends nevertheless on the sectorial perspective. For the oil and gas sector the effects are potentially dramatic. Some segments of the US shale oil industry are in dire straits and the same can be said for some of the more expensive (e.g. deep sea and ultra-deep sea) oil and gas projects. However the latter projects have a long-term horizon and the oil price may well be recovered when these projects come on stream. The effect on many other sectors is considered positive however. All industries that use oil as a production factor one way or another (for example transport, petrochemicals and energy intensive industries) as well as households are expected to benefit from a lower oil price. Table 1 summarises the estimated impact on the most important sectors. The sectorial impact is also dependent on the country structure, with countries that are highly reliant on oil export being most vulnerable. The finance sector in such countries for example will be relatively more exposed to the oil sector. Also the machines and manufacturing sectors may be closely intertwined with the oil production sector. The risks to these sectors will therefore be negative in countries reliant on oil income. The countries most vulnerable to a lower oil price, and thus to lower income from oil sales, are generally the countries with a very dominant oil industry – those in which the oil industry represents a relatively large share of the national economy. 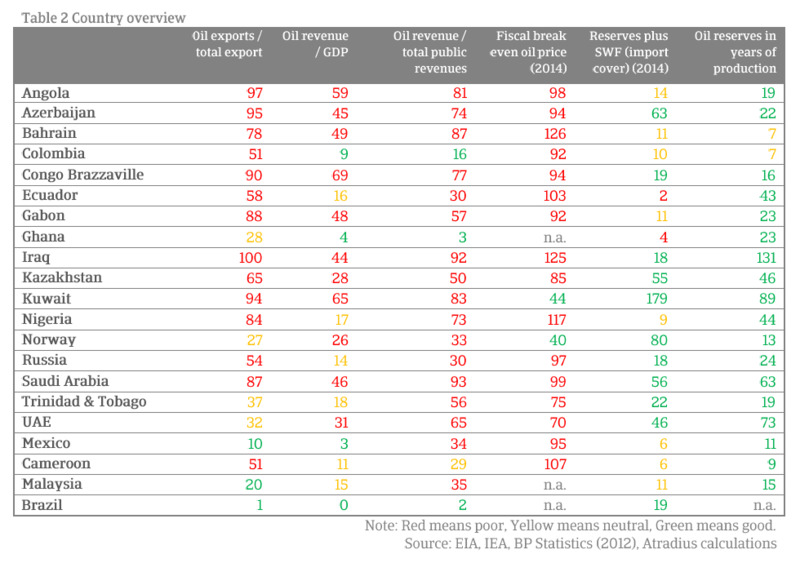 To assess the impact by country Table 2 shows countries that are largely dependent on oil production and export, either for their economy as a whole (GDP) or as a source of income for public finances. This shows that Angola, Azerbaijan and Bahrain are the most vulnerable countries. But Norway and Russia also make the list. First of all we have to stress that the oil price developments are uncertain, even more uncertain than normal. Nevertheless we have contemplated a scenario that we consider the most plausible. For 2015 and 2016 we follow the projections of the US Energy Information Administration (EIA). This is a US government related think tank responsible for the analysis of global developments regarding energy. We expect that the low oil price will hit the US shale industry badly and will result in a significant decrease in active shale oil projects. We have already observed the number of active oil rigs in the US decline (the number of active onshore oil rigs in the US decreased from 1759 to 951 over the past 12 months) and we expect this trend to continue. In the fourth quarter of 2015 this is likely to have a significant impact on oil supply and the price is therefore expected to rise. Nevertheless this rise should not be steep since the strategic petroleum reserves are largely at maximum capacity, especially in the US. We believe the increasing oil price trend in the fourth quarter will result in an average price of USD 58 per barrel of Brent oil in 2015. This increasing price trend is expected to continue in 2016 resulting in an average price of USD 75 per barrel in 2016. 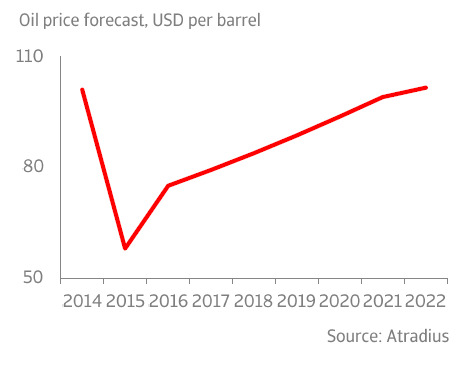 In the years thereafter we expect a gradual recovery of the oil price up to USD 99 in 2021. In the period after 2020 the US total oil production (conventional plus shale oil) has reached a ceiling due to the depletion of conventional fields and a gradual decline will take off. This implies that the major cause of the current oil supply will slowly disappear. As with all predictions of the future there are upward and downward risks. To start with the latter: a disappointing recovery of the oil price could be caused by a quicker than expected recovery of the US shale industry. The industry has shown a remarkable degree of technological innovation and cost cutting in the recent past and this trend may continue. If most shale oil projects manage to push their break-even cost significantly below USD 70 per barrel (in Brent terms) a structural low oil price could become sustainable. The effect of a shale oil driven oversupply could be even worse if it would be replicated in countries outside the US. It is known that shale oil reserves in countries like Canada, Argentina, Russia and China are enormous. However the business conditions in these countries are so different (with the possible exception of Canada) that this is not likely in the short-term. Also the behaviour of OPEC poses a downside risk. As stated above we expect OPEC to resume its traditional role as market stabiliser. This is not a certainty however. If OPEC (read Saudi Arabia) considers defending its market share a key priority and accepts a lower price, also in the medium-term, then the excess supply may continue longer than expected. Apart from the OPEC production decision, another issue has emerged from an OPEC country. The Western powers have reached an agreement with Iran and this may be a prelude to a more extensive deal next year. If the international sanctions on Iran were lifted and Iran would be able to export oil in the same amounts as it did before the sanctions were introduced, this would mean an increase of the global oil supply with 1.5 million barrels per day. The last downside risk stems from the energy policies of emerging markets. From emerging markets stem the greatest oil consumption growth and a switch towards renewable energy is not a key priority. Nevertheless this might change. We know that China is a centralist state and that air pollution is a severe problem. A sudden switch towards, for example, electric or hybrid cars, trucks and trains would have a significant impact on global oil demand growth. If these risks materialise, a long-term oil price of USD 70 per barrel (in real terms, thus increasing only with inflation) would be imaginable. Nevertheless a scenario in which the price of oil goes through the roof would also be conceivable. Further unrest in the Middle East or escalating tensions with Russia would be a possible cause of supply disruptions. Also the large scale cancellation of new oil investment (already underway as it appears that some projects have been cancelled or postponed), could mean that oil supply in the medium-term would be significantly reduced resulting in strong upward pressure on the oil price. Despite the UAE’s overall diversification, the lower oil price is expected to take its toll on economic growth.